Too many companies fall into the trap of designing a stark and boring website, or a loud, gimmicky one. These opposite sides of the design spectrum tend to push potential customers away, making them feel either like they shouldn’t care about the product or service, or that they are being bombarded and dragged into a sale. There’s a sweet spot in tennis, baseball, golf, and, yes, even in website design. 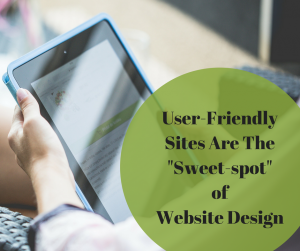 Local businesses in St. Charles need to find their “sweet spot” in website design to draw in and preserve traffic. Are the most important pieces of information immediately visible? Does my visual design and site aesthetic feel appropriate for the brand I am marketing? Do the colors match well? Is there a healthy balance of images and text? Are all elements on the page spaced evenly? Is navigation smooth? Are links clear, concise, and easy to find? Do all of my website design choices carry over well to mobile? Don’t get caught up in fancy transitions, an abundance of scrolling images, or avant-garde layouts; just remember to focus on the fundamentals of visual standards and ease-of-use. There are several great website design tools that offer professional-looking templates, great for small businesses in St. Charles. However, as a business owner, you need to remember to control your brand and stand out to potential customers. To make your website appear less dull in comparison to other small business sites, it can help to alter some aspects of the template, including the font, color scheme, and adding appropriate icons for links to other pages or social media. Only when your website looks amazing with the fundamentals should you add a little flair! Of course, Vision Force is here to help with making the web design process a breeze! We offer a variety of services to not only get your website beautiful and working smoothly, but to bring your company to its full potential through that website! Some services include hosting, optimization, CRM, e-mail marketing, video, digital marketing, creative services, strategic marketing, branding, social media marketing, brochures, Yahoo, Google, bing PPC ads and marketing consultation. Website design for St. Charles businesses doesn’t have to be complex or difficult with the help of Vision Force, and we will find that perfect “sweet spot” for your website!